Many people feel apprehensive when shopping in huge departmental stores - finding the array of shops and escalators overwhelming. In extreme cases this can put them off shopping altogether. 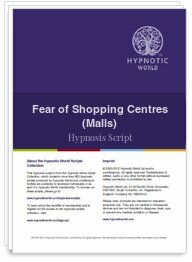 This Fear of Shopping Centre (Mall) hypnosis script takes your client on an imaginative journey where they can put aside their fears and enjoy their shopping experience.